Charlie Osborne, MA CCC-SLP joins Peter Reitzes and Eric Jackson to discuss the term fluency and a classic book from 1972 by Wendell Johnson and Dorothy Moeller titled Living with Change: The Semantics of Coping. We discuss topics and quotes from Johnson & Moeller including acceptance, success, the importance of language in thinking and working on stuttering, IFD Disease (from Idealism to Frustration to Demoralization), making therapy and the use of speech tools less complicated and so much more. Charlie Osborne is a clinical assistant professor at the University of Wisconsin in Stevens Point. He teaches the fluency disorders course and other courses, supervises in clinic, and provides clinical services at St. Michael’s Hospital. 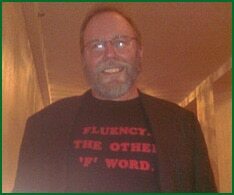 Charlie is past editor of the ASHA Division 4 Perspectives on Fluency and Fluency Disorders – a peer reviewed journal and has worked with children and adults who stutter for over twenty years.